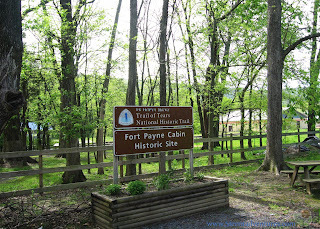 Fort Payne is located just a few miles west of the middle section of Lookout Mountain. Throughout history this city has witnessed the creation of the Cherokee alphabet, the expulsion of the Cherokee Nation from the south, a boom and bust cycle, an industrial rebirth, and the rise of country superstars. There are glimpses into this past all over the town - you just have to know where to look. Location: Fort Payne is located in Northeastern, Alabama just a few miles east of Interstate 59. Cost: All of the places on this list are either free or only cost a few dollars per person. 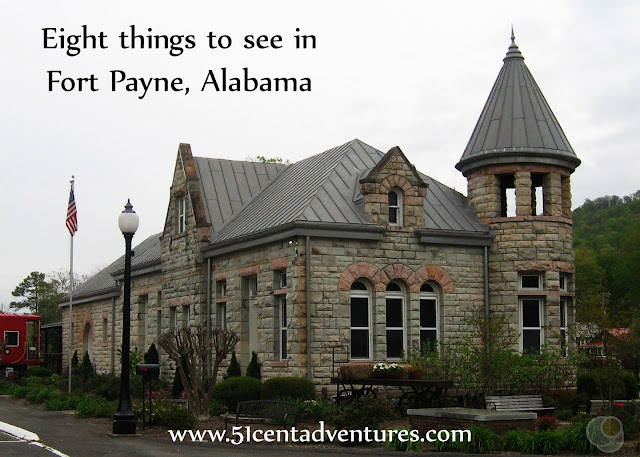 Fort Payne was officially the third stop of the third day of our road trip to the Lookout Mountain area of Alabama in April of 2016. My family regretfully left the Little River Canyon so that we could go to the store to buy some things we needed for our campsite that night. We went to the Walmart in Fort Payne, and then went to the Depot Museum and the park near the down town area of Fort Payne. Sorry to anyone who lives there, but from a tourist standpoint Fort Payne is just another small town. There is hardly anything of note about the city of Fort Payne. 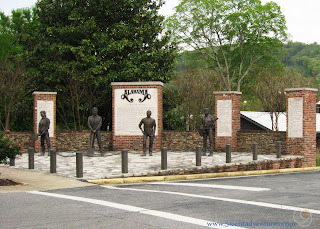 What is unique and interesting about Fort Payne is that it is located just a few miles from the middle section of Lookout Mountain. Amazing places like DeSoto State Park and the Little River Canyon are just a short drive away from Fort Payne's down town area. Ideally my family would have spent all our time on Lookout Mountain, and never ventured down into the Fort Payne Area. But there were two things that ensured that we made it down to Fort Payne just about every day. One was that we had to drive through Fort Payne to reach Interstate 59 a few times. The other reason was that there is a Walmart on the west side of in the interstate, and we needed to buy things there at least twice during our trip. 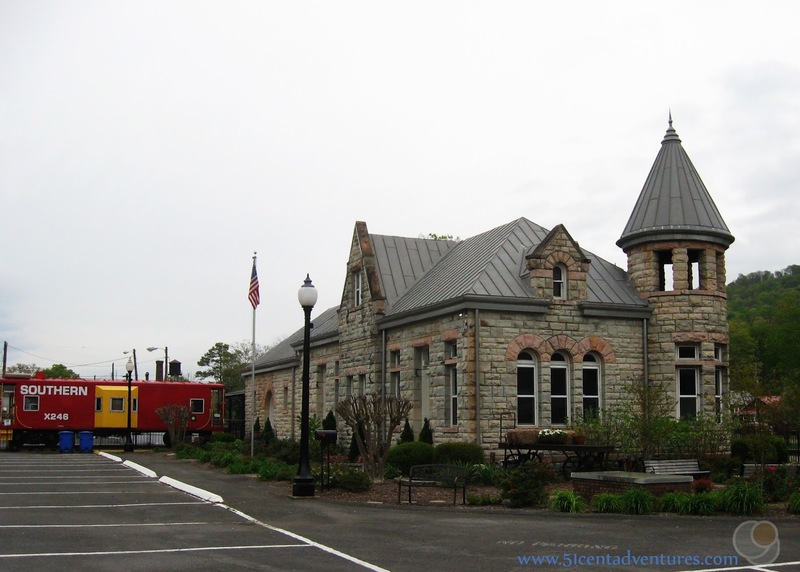 The Fort Payne Depot Museum is open on Wednesdays, Thursdays and Fridays from 10:00 to 3:00- though the museum is closed for lunch from 12:00 to 1:00. The museum is open on Sunday's from 2:00 to 3:45. The cost of admission to the museum is $3 for adults, $1 for students from ages 7 to 18. And free for anyone age 6 and under. The museum houses items from the area's past. There are several permanent exhibits as well as rotating ones. 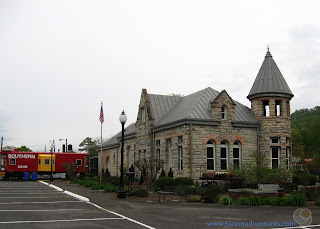 This was the one place in Fort Payne that caught my eye when I was researching things to do in the city. That is because my son is obsessed with trains. Any time I read about a train museum I know that we are going to go check it out. When I googled the museum I was interested in the look of the building. I've never seen a depot this beautiful before. According to the website the building is in the Richardsonian Romanesque style and is constructed of locally quarried pink and white sandstone. This building was constructed when oil and mineral speculation caused Fort Payne to turn into a mining boom town back in the late 1880's. That boom ended several years later, but the depot remained. Unfortunately, by the time we reached the museum on Wednesday, the museum had already closed. My son and I walked around the building and admired the caboose on display behind the museum. But a locked fence kept us from getting near the caboose. Both of us were rather disappointed that we didn't get to see more trains on display outside the building. However, our disappointment was quickly forgotten a few minutes later when a real live working train went by on the train tracks next to the depot museum. When you travel with young kids it doesn't matter how many unique things you have on your itinerary, they are always going to want to spend some time playing on a playground at a park. So while my son and I walked around the Depot Museum my husband took our three daughters across the train tracks to the Alabama Walking Trail Park. The park has two playgrounds in addition to several well kept walking trails. 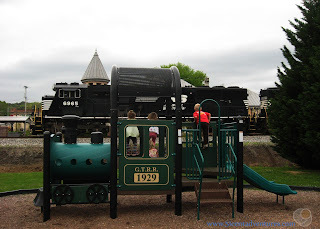 Our children loved playing on the little train shaped playground. They all took turns pretending to the the engineer, conductor and passengers. And they frequently yelled "All aboard!" City Park is located to the South of the Depot Museum across 5th Street. There isn't a good pedestrian crosswalk between the Walking Park Trail Park and the City Park so we didn't cross 5th street to go to City Park. But the kids' wished we could. City Park had another play ground that included a swing set. 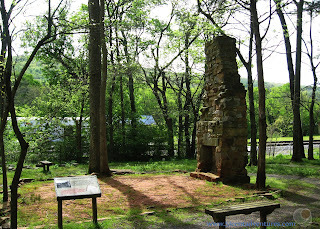 I wanted to go over there to read the many plaques describing important people and events in Fort Payne's history. Unfortunately, we ran out of time to do that. Apparently there is an Opera House located to the east of the Depot Museum. I never noticed it while we were in the city. The Opera House was built during the same boom times when the Depot was constructed. It has been preserved, and is occasionally still used for live events. It's open for tours by appointment on Thursday, Friday and Saturday between 10:00 and 3:00. Call (256) 845-6888 to schedule a tour. 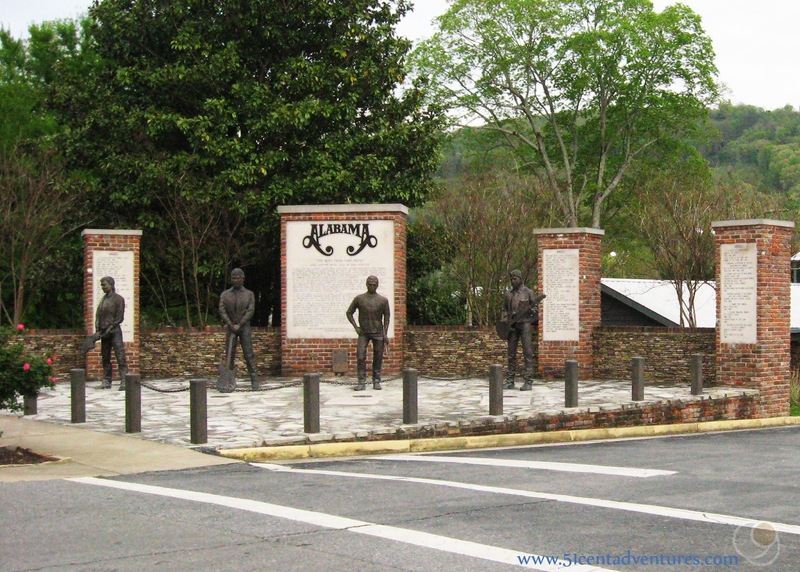 Fort Payne is the hometown of the country music group, Alabama. This group had an unrivaled streak of 21 #1 singles. A monument to the group is situated on the south eastern corner of City Park. Cost to visit the museum inside the fan club is $3.00 for Adults, $2.00 for Seniors, $1.50 for children under 12. While we were in Fort Payne I couldn't think of single song by Alabama. But after we came home I realized that I recognize (and even love) a few of Alabama's songs. I kind of wish we'd stopped by the fan club and museum. Regrettably, the Fort Payne area played a major part in the Trail of Tears. Most of the Cherroke Indians that were forced to leave their homes in the south were forcibly gathered to Fort Payne before leaving on their long and heartbreaking trek to Oklahoma. The trail of Tears National Historic Trail seeks to preserve this terrible period in American history in order to prevent something like that from ever happening again. 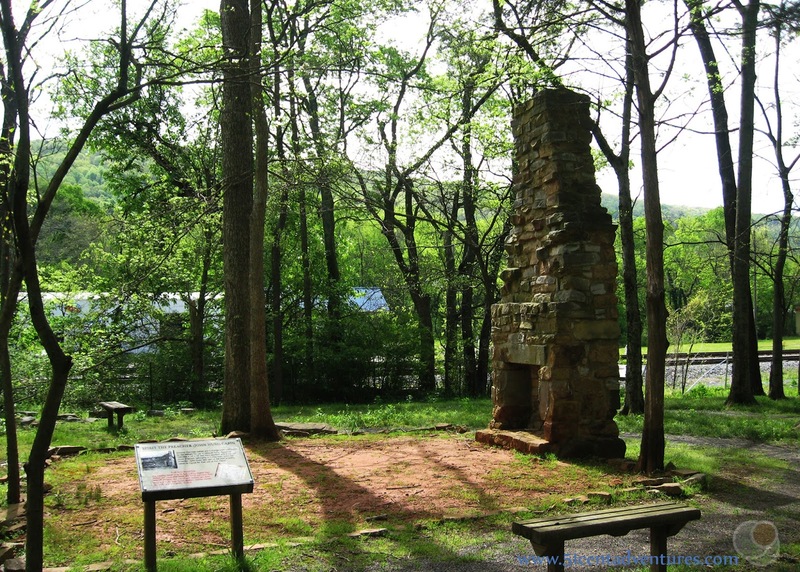 One of the few places left from this era of Fort Payne's history is the Cabin Site. This home was owned by a Cherokee named Spirit or John Hutton before it was seized by the military in 1837. According to the information signs. This site was part of a larger complex of open encampments with the perimeter patrolled by soldiers. Today all that is left is the foundation line, and a large stone chimney. One of the most famous Cherokee people was a chief named Sequoya. In the 1820's he realized the need for his people to have a written language. So he worked for 12 years to create one. He was the only known person in history to ever conceive and perfect of a alphabet in its entirety. He completed the alphabet while he lived in Fort Payne. City Park has a plaque detailing the accomplishments of this man. Just off of Highway 35 at the base of Lookout Mountain. We didn't have time to visit this park, but we passed it every time we traveled to or from Lookout Mountain on Highway 35. It has a fun looking playground that my kids always wanted to play on. My husband and I constantly had to remind them that they'd played on enough playgrounds and that we were on vacation to see things that they couldn't see anywhere else. Recommendation: Like I said, if you are in Fort Payne, Alabama you should focus your time on visiting the Little River Canyon or Desoto State Park. 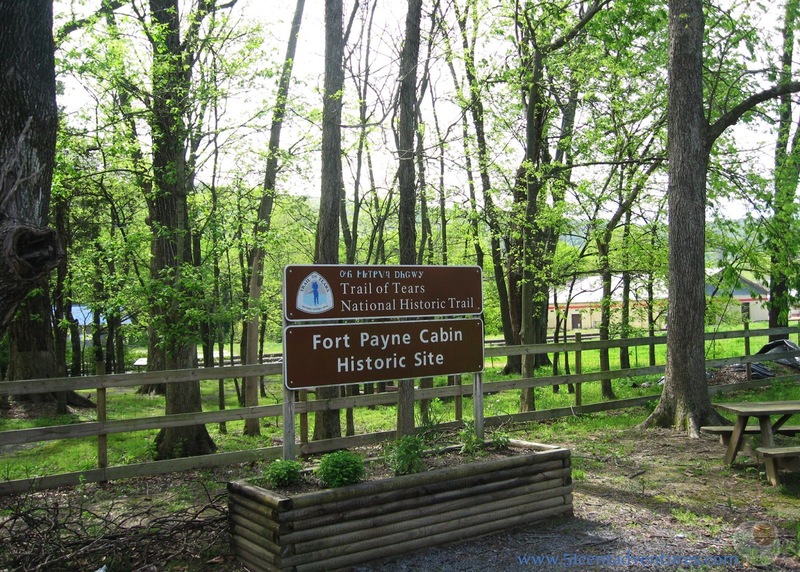 But if those places aren't an option then Fort Payne does have a few places of historical significance as well as some nice places for recreation. Directions: Fort Payne's main street area is located within 2 miles of Interstate 59. Take Exit 218 and head east. When you come to the fork in the road take a left onto Gault Lane which is the town's Main Street. Additional Information: For many years Fort Payne was known as the Sock Capitol of the World. Thousands of socks were knit in this town. However, overseas outsourcing has mostly erased this once thriving industry. However, there still are some companies that make socks in Fort Payne. The most notable of these is zkano socks. This company is owned and opperated by a long time resident of Fort Payne, Gina Locklear. The company uses sustainable practices to create socks made from organic cotton.